Lets start by opening the image in Photoshop. 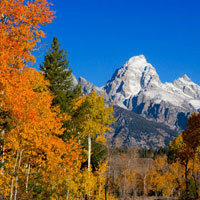 Velvia is a high saturation film best suited for landscape photography. Because of the high level of saturation produced by this effect, I don’t recommend using portraits or photos with people, unless of course you like that tan-from-a-bottle orange-skin look. This is a photo I took of the Tetons in Jackson Hole, Wyoming. It was shot with an old Nikon D100 which was known for weak color, which makes it a perfect shot for this effect. The first item of business is to switch the color space to Lab color. 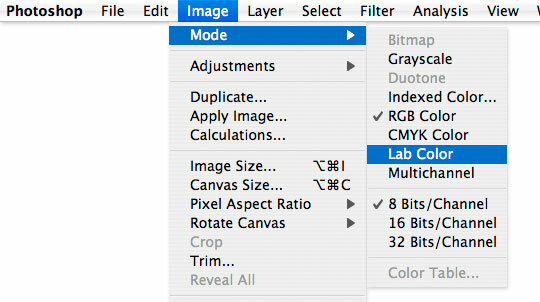 In the main menu choose Image>Mode>Lab Color to make the change. One of the many benefits of Lab color is that this mode actually separates the Luminosity from the actual colors in the image, allowing us to work with the color more directly than if we were stuck in RGB mode. 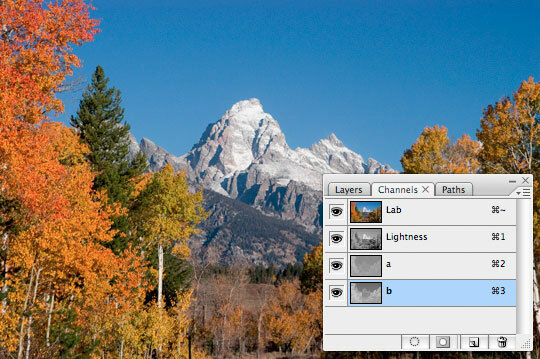 Open the Layers palette and click on the Channels tab to see what I mean. Notice that instead of having Red, Green and Blue channels like RGB, with Lab Color we have a Lightness channel and two color channels labeled "a" and "b". 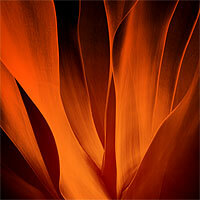 The Lightness channel holds all the tonal information. This is important because with this adjustment we want to isolate the colors without effecting the overall brightness and contrast of our image. Go ahead and click in the "a" channel to select it. You’ll notice that the entire image turns to a grayscale rendering of this channel (and quite an unattractive version at that). 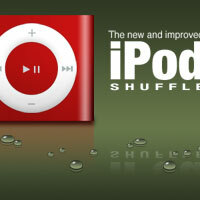 Since we obviously can’t go adjusting color with the image in this condition, I’ll show you the fix. 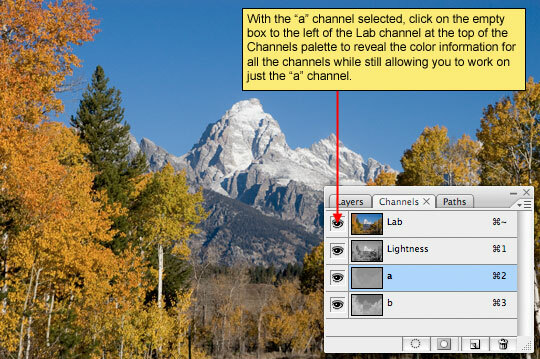 Once you’ve selected your color channel, in this case the "a" channel, go ahead and click on the empty box to the left of the Lab channel at the top of the channels palette, this will turn the other channels back on but will allow us to only adjust the "a" channel. 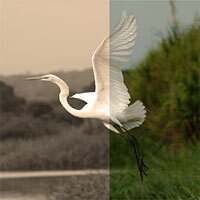 The trick to increasing the contrast in these color channels is to increase the contrast inside the channel. To do this we’re going to use the Levels adjustment. 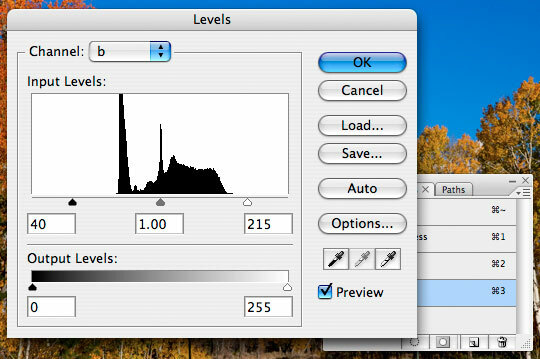 You can call up the levels adjustment easily by pressing Command-L (PC: Ctrl-L) or by choosing Image>Adjustments>Levels from the main menu. 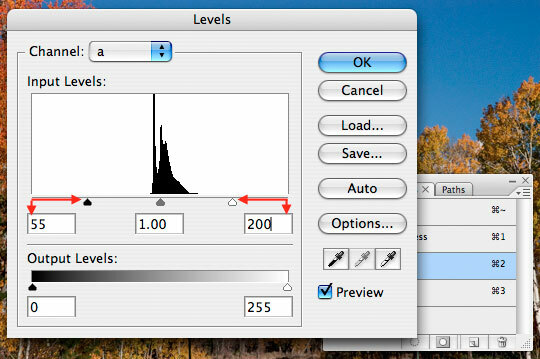 In the Levels dialog box, drag the right and left arrows toward each other until the saturation is satisfactory. While adjusting the first color channel (the "a" channel) the overall color balance in the photo might get a little funky, but don’t worry, it’ll straighten itself out when we adjust the "b" channel. The most important thing in this adjustment however is that we bring in both the right and left sides equally. Trying to do this by touch is quite a trick, but math makes it easy. Notice that in the beginning the fields under the histogram read 0/1.00/255, these numbers represent the position of the markers respectively. Sliding the right marker to the left will make the corresponding number go up, and dragging the right slider to the left will bring it’s corresponding number down. So whatever you add to the left, you must subtract from the right. Lets make this example simple and I’ll bring the left slider up to where it’s corresponding number is 55. This now means that I must bring the slider on the right down 55, making it’s value an even 200. By doing this we ensure that our center point remains constant and that we don’t skrew things up altogether. Click OK when the saturation in the photo looks good. Now we need to repeat the same process for the other channel so that all the colors have the same vivid look. In the channels palette, select the "b" channel. The four eye icons should still be visible but if they aren’t, simply click on the visible option located on the left of the Lab channel and the four eye icons will appear just like we did before. Now repeat the same process with the Levels tool that we did earlier. 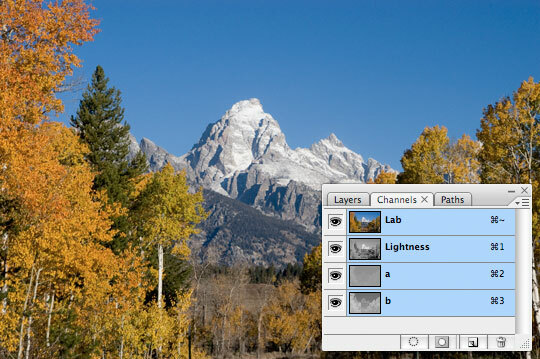 Press Command-L (PC: Ctrl+L) or choose Image>Adjustments>Levels from the main menu and move the black and white input sliders towards the center to compress the histogram. The settings should be the same as the ones you used earlier as a start. 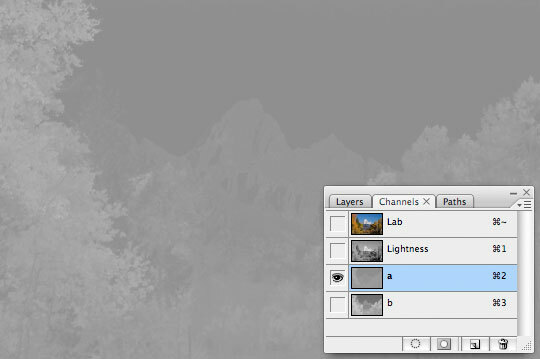 Once you have it set with the same settings as the other channel, you can adjust the sliders to alter the intensity of the colors for this layer. For example, if you don’t want these certain colors to be that vivid, simply move the two input sliders further apart to reduce the compression of the colors. 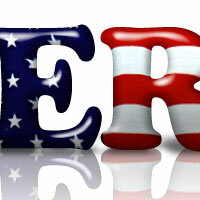 Just like before, make sure the sliders are an equal distance using addition and subtraction in the numeric values corresponding to each slider. The final step is to switch the image back to RGB color mode by choosing Image>Mode>RGB from the main menu. Below you see my before and after the changes. In my final image I used the Selective Color adjustment to increase the level of black in my blue tones, which darkened the sky and gave the image an overall better feel. This Velvia effect can be incredibly effective on the right photograph and just plain stupid on the wrong one, so be careful. 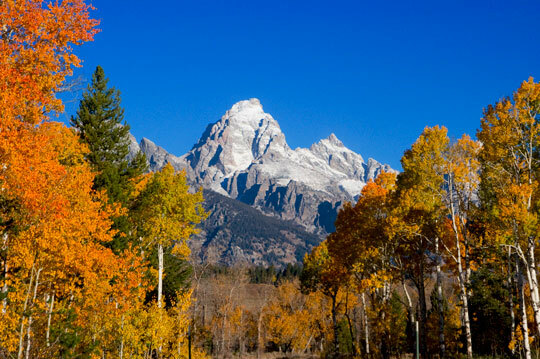 Keep in mind that many film and slide photographers have considered the over saturation produced by using Velvia film to be too much for their tastes, and the results, even from original Velvia slide film often seem a touch unrealistic due to the extreme saturation of some colors. I think this is the ultimate color correction tutorial for me…WAY more effective than anything else I’ve been doing. Thank you very much! You make some grand tutorials! I also found your blog from Lifehacker, Defiently got another reader here. Keep up the good work. Just a side note, the adjustment you make with the Levels can also be done by using a adjustment layer and then within the Levels box you can select which channel (Lightness/a/b) to work on. Saves a few steps there and lets you undo changes at a later date. I have just found your site – sent here by one of my readers. I will certainly recommend all to visit. 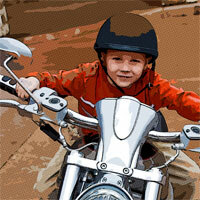 The aim of my blog is to introduce people gently to digital photography and image editing. Your site is straightforward with no messing. I found your website via lifehacker and WOW, i am really new to both serious photography and photoshop but I’m going out every day now to find new pictures to take just to use your tutorials! Thanks for all your great advise and the effort you put into these. I’m losing sleep just to keep reading them! Thanks for the tutorial. 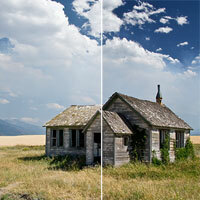 Ive never tried adjusting images in Lab mode before – great results! I’m new in photography and just recently bought a DSLR. At first was kinda frustrated with the final result of my images as compared to photos I’ve seen as I didnt do much on the post processing part. 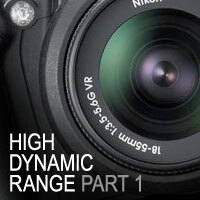 With this tutorial, you have made me all fired up for my next photography outings! This effect is really AWESOME!